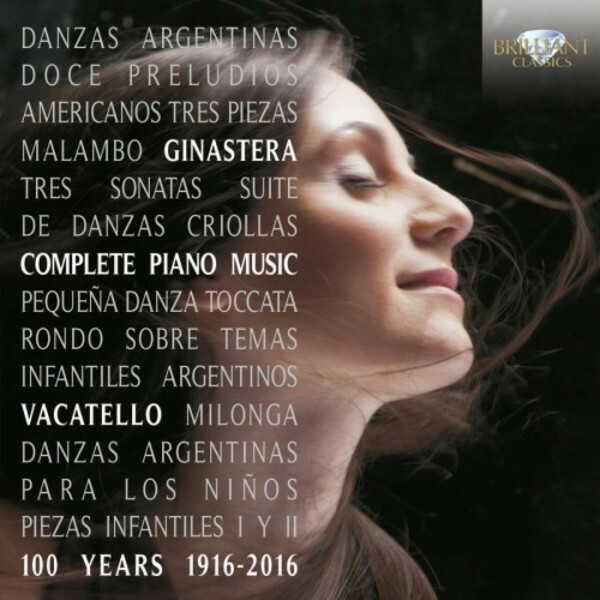 This CD contains the complete piano music by Alberto Ginastera, one of the most important composers of 20th century Argentina. His piano works brim with Latin-American passion: brutal, sensual, evocative, sentimental, always filled with the vibrant rhythms and colours of the folk music and dances of his home country. Ginastera�s piano sonatas are grim, 'serious' works, full of motoric drive, and sometimes 12-tone melodic lines. The shorter pieces (like the famous Danzas Argentinas) are highly entertaining and virtuoso, big fun! Italian pianist Mariangela Vacatello has all it needs (and more) for this music: abundant virtuosity and a strong feeling for the Latin idiom of this fascinating music. Excellent liner notes written by Ginastera�s daughter, and biography, are included in the booklet.